Pre-planning is the most important thing for a successful project. For me the phase of planning also takes quite a long time, sometimes just as long as the actual workmanship or even longer. 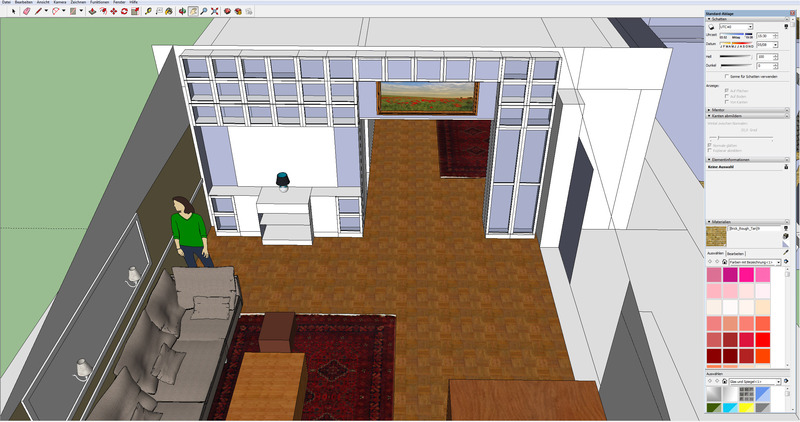 To visualize the basic planning I use Google Sketchup (free freeware) for the simple reason that it makes the subsequent detailed planning much easier. In addition, most IKEA furniture is available inside the “3D Warehouse”. These 3D models can be loaded into an existing model. Thus equipped different planning variants can be presented or new ideas mature on the variants, problems arise and solutions are found. 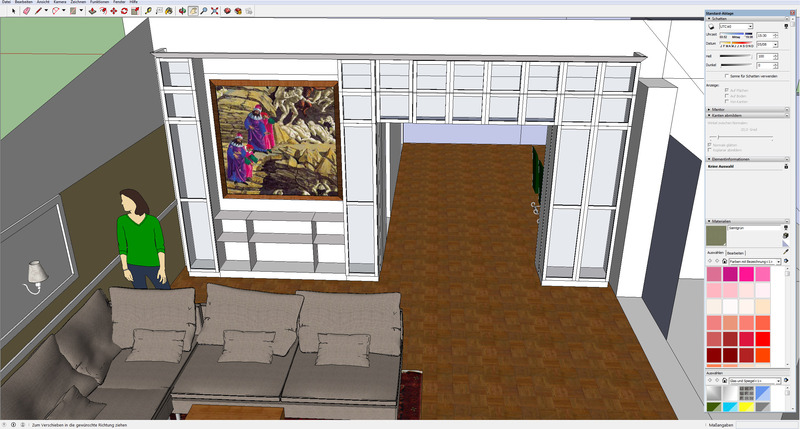 The best way ist to draw the room right in scale first and than start playing with the interior. Below are two designs of a Billy bookcase wall of which the top design was realized. Based on the three-dimensional sketch there can be thought about how certain things can be implemented that are not drawn in detail. So it was quickly clear that the bookcase wall must be increased by 6cm in height. Since finished baseboards should be used for it a suitable measure had to be found. For example if the base is too high the bookcases will come into conflict with the doors, if the base is too low the passage will be blocked by the bookcase in terms of height. The side walls of Billy bookcases have cutouts for baseboards so on the inside of the passage there will be need to mount topsides. Topsites were also mounted on the inside of the large niche to conceal the transitions of the 202 cm high Billy bookcase to the small top Billy height extension unit. The Billy height extension unit do not have their own floor as they are usually placed on other bookcases. Therefore a stable base plate had to be mounted which stands all weight (calculate the statics with standard values). In addition a stable solution had to be found for connecting the free-floating row of the Billy extension units to each other. I decided for M6 furniture connectors (4 pieces per side of a unit). The back wall of the large compartment was planned with CD / UD profiles and appropriate planking (OSB and gypsum plasterboard). Stucco profiles for framing the large compartment were ordered. The visible part of the cornice was also planned with polyurethane stucco profiles. 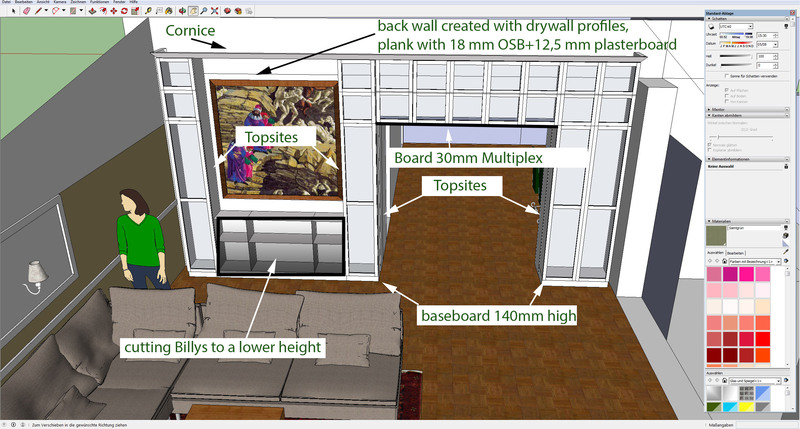 The middle Billy bookcase row should be reduced to a lower level, since the standard 106 cm are too high especially if later a TV is set to stand on it or if you project images with a projector at the niche. The overall picture was not consistent with 106 cm high middle bookcases (already shortened in the drawing). The following picture illustrates only some of the considerations and plans that were involved in the realization of the project. After completion of the planning all required parts were ordered. The construction of the Ikea furniture itself is still the simplest part.